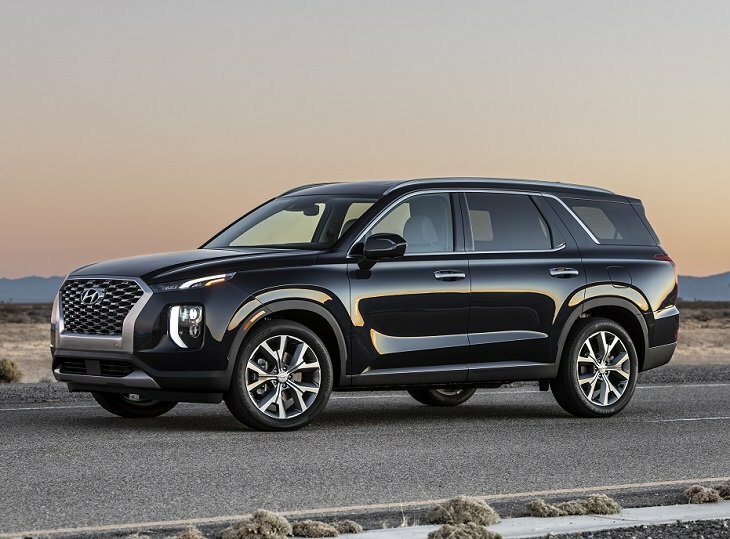 Joining Hyundai’s 4-model SUV lineup, the 2020 Palisade is bigger than the model it replaces, firmly moving the automaker into 8-passenger family SUV territory. Hyundai hadn’t outlined Palisade trim levels during the SUV’s debut at the 2018 Los Angeles Auto Show, but the plan likely mirrors the 5-passenger Santa Fe. That means you’ll choose from SE, SEL, Limited, and Ultimate trims, the latter opulently fitted with premium Nappa leather upholstery, every possible option, and a price closing in on $50,000. If you’ve seen the new Hyundai Kona or redesigned Hyundai Santa Fe, you’ll understand where the Palisade’s design theme is coming from. It has a unique look, one you won’t mistake for anything other than a Hyundai SUV. Vertical lighting elements are a new twist here, as is the Palisade’s greenhouse and roof pillar treatment. In some ways, the design is evocative of popular SUVs already on sale, and in other ways it is something completely different. Standard equipment includes a set of 18-in. wheels, which look too small under the exaggerated over-fender treatment. You can upgrade to 20-in. wheels for a more balanced look. Inside, an oversized 10.25-in. infotainment system display makes it easier to reference and use the technology, but Hyundai also thoughtfully includes separate stereo and climate controls to minimize screen interaction while driving. As an option, a 12.3-in. digital instrumentation display is available. Clearly designed for family duty, Hyundai promises that the new Palisade provides impressive second- and third-row seat room. In addition to plush leather, the Palisade is available with heated and ventilated front seats, and heated and ventilated second-row captain’s chairs. Storage space and cargo volume were also priorities for this new SUV, Hyundai says. Electronic transmission control frees up space on the center console, while cargo volume measures up to 45.8 cu. ft. behind the second-row seats. A total of 16 cupholders are aboard to accommodate drinks large and small. The Palisade also has unique diffuser vents in the roof, which help to better direct and manage airflow. Hyundai powers the new Palisade with a new Atkinson-cycle, direct-injection, 3.8-liter V-6 engine. It makes an estimated 291 horsepower and 262 lb.-ft. of torque, which is transferred to the wheels through an 8-speed automatic transmission. All-wheel drive is an option, and it comes with a locking differential. Normal, Sport, Smart, and Snow driving modes help to tailor power delivery to desired outcomes. If you park the Palisade and forget to choose Park, the SUV automatically does it for you if you shut off the engine and open the door to exit. The new Palisade’s list of standard driver-assistance and collision-avoidance technologies is a lengthy one. In addition to increasingly common systems governing cruise control, collision warnings, and collision prevention, the Palisade features stop-and-go adaptive cruise, pedestrian detection, lane-following assist, driver monitoring, and a Safe Exit system intended to prevent occupants from opening a door when traffic is approaching the SUV from behind. A seat belt usage monitor also tells the driver when one of the Palisade’s eight passengers isn’t buckled up, and which person it is. Blue Link subscription services is also available for the new Palisade, and it includes key safety features like automatic collision notification, emergency calling, and safe teen driving settings related to vehicle speed, curfew time, and passing behind specific geographic boundaries. Hyundai provides these functions, and more, at no cost for a mighty generous three years. As an upgrade, owners can equip a Palisade with a rear-occupant alert system. Designed to prevent parents and pet owners from leaving important loved ones inside of the SUV, this technology goes a step further and can alert you if a child gets into the Palisade and gets locked inside. Ultrasonic sensors can detect movement, and when they do the SUV’s horn starts honking and you get a Blue Link alert message on your smartphone. Another new safety feature is called Blind View Monitor. This is not a replacement for the Palisade’s standard blind-spot monitoring technology. Rather, it is an enhancement, using cameras on both sides of the SUV to show a video feed of what’s alongside the Palisade whenever the driver uses the turn signal. The image shows within the instrumentation display, where it is easy for the driver to reference. In addition to Blue Link, the Palisade’s infotainment system includes Apple CarPlay, Android Auto, and the ability to pair two different phones to the Bluetooth at the same time. That way, one phone can be used for calls while the other phone is used for music streaming. Blue Link is compatible with both Amazon Alexa and Google Assistant and works with Apple and Android smartwatches. Driver Talk allows the Palisade’s driver to communicate with second- and third-row passengers through the SUV’s stereo speakers. It also has a Sleep mode, so that when the kids have fallen asleep in the back, Mom and Dad can still enjoy music or other programming up front. Navigation is available for the Palisade, as is a premium surround-sound audio system and a head-up display. Hyundai provides USB ports in all three rows of seats to ensure that everyone has device charging access, and wireless charging is also available.